On April 5th, the SCA hosted a meeting about parking in our area. Michael Connor, Arlington County’s parking manager, and Mickey Papillon, Federal Realty’s Director of Asset Management for the Village of Shirlington, presented recent and proposed changes. Residents and merchants including Signature Theater, Guapos, Ichiban, and Yogi Castle explained problems and shared ideas for improvements. The new “Pay to Park” system in the Village was in the main acceptable to residents at this meeting, though more advance notice would have been appreciated. 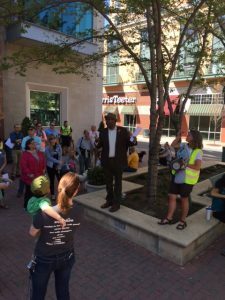 (1) It was criticized, however, for allowing new street parking on either side of the white stone fountain plaza in the middle of Campbell Avenue. This fountain was created as a visual focus for the Village and is much used in good weather by kids and families. Following the SCA meeting, the relevant County teams acknowledged that those signs and meters will be removed, but the schedule has not been set. (2) Participants also asked that early morning paid parking in front of Best Buns and Peet’s, our two bakery and coffee shops, be re-assessed and, if possible, eliminated. Our business model has for years been built on encouraging morning “swing-by” customers. The County will work on this request and on fine-tuning the Pay to Park system over coming months. The Campbell Garage behind Harris Teeter was the other focus of discussion. (1) Years of an untenable parking agreement – Twelve years ago many different entities were given “rights” to park in this structure in an agreement crafted by the County with the owner, Federal Realty. This agreement has never worked as intended, parking has become balkanized, and enforcement has been uneven and punitive. For years now, the 4th floor and ramp area of 160 spaces set aside for the Delancey apartment tenants has been almost empty while parking on lower floors was jammed and tow trucks hauled cars out. The signage is immensely confusing. Theater patrons, library users, and residents and their visitors have all had bad experiences that hurt the reputation of the Village. Years of complaints have gone nowhere. (2) The County and Federal Realty have now agreed to work on a plan to review and, if necessary, amend and enforce the Campbell parking agreement. The SCA has informed the County Board that resolving this situation is one of our TOP priorities. Following the April 5th meeting, an “all-points bulletin” was sent by Parking to Community Housing Planning Dept. (CPHD), Zoning and Dept. of Environmental Services (DES) staff and relevant staff will meet to discuss next steps. 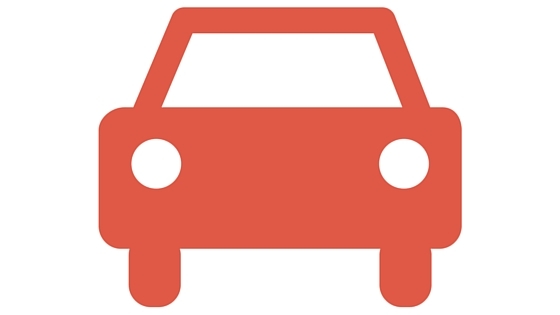 Our next civic association meeting will take place on June 8th, 6:30 p.m., at the Shirlington Public Library, and will focus on the detailed plan for theWalter Reed Drive intersection changes proposed by the Transportation section of DES. A separate notice will be sent but please mark your calendars. Speaking of parking changes, later this week, the Oxford Street parking lot between Jennie Dean Park and the Shirlington Dog Park will be milled, repaved and re-striped to create more parking spaces. This is long overdue and another improvement for which we have advocated. Christian Dorsey and John Vihstadt at the event. 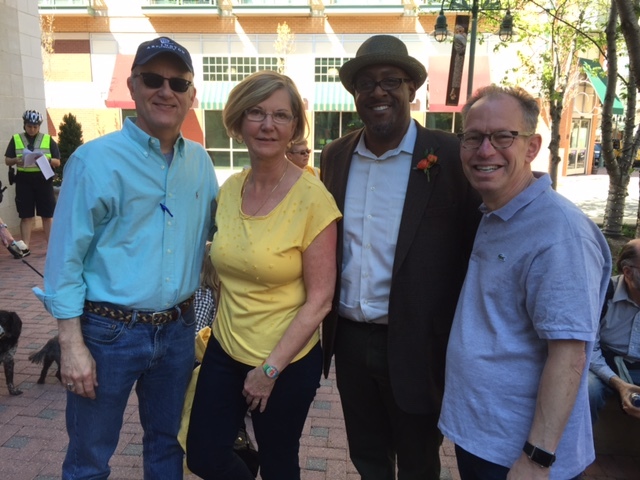 A wonderful spring afternoon and some 80 participants were the ingredients of a very successful WalkArlington’s Shirlington Walkabout in early April. Shirlington is home to a Tony award winning regional theater, recreational facilities, restaurants featuring cuisine from around the world and unique retail shops. 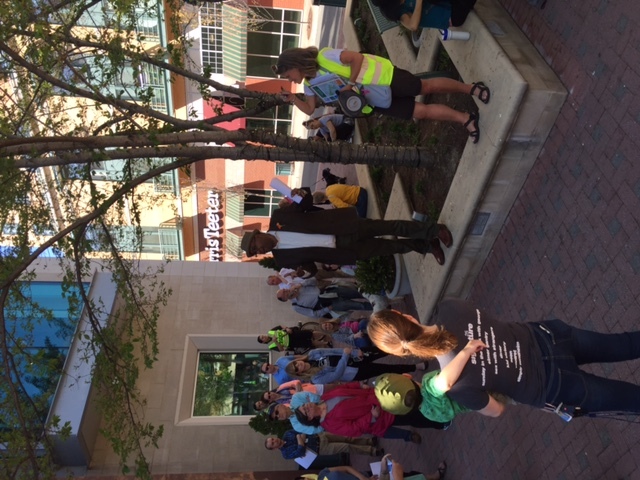 The two mile, two hour event kicked off in front of the Shirlington Library where County Board Member Christian Dorsey encouraged participants to take advantage of the area’s diversity. Walkers traversed many streets and paths. Stops included the Arlington Trades Center, Animal Welfare League, the county’s largest local dog park and Jennie Dean Park. Speakers at the stops talked about how they contribute to making Shirlington a dynamic community in which to live or visit. At the WETA building, Board Member John Vihstadt discussed the county’s initiative to create a long term development plan for Shirlington and adjacent areas. Who are we in the Shirlington Civic Association? The SCA area runs from 395 to Arlington Mill Drive to Windgate 1 across Walter Reed Drive and up to the intersection with Rt.7. It includes the residents, commercial property owners, and businesses in the Village at Shirlington. It also includes eight nearby homeowners’ associations that have never been in any civic association: The Arlington, Courtbridge I, Windgate Village of Arlington I, Windgate Village of Arlington II and Windgate Village of Arlington III, The Heatherlea, and Shirlington Village Condominiums. Residents of the three apartment complexes within this area are also included — the Io Piazza, the Windsor, and the Delancey. Last but not least, the SCA area covers some important Arlington county institutions — The Arlington County Trades Center, the Shirlington Public Library, the Shirlington Bus Station, and the Animal Welfare League, all county-owned properties, and of course both the Signature Theater and the Energy Club. “Shirlington Civic Association? We’ve been waiting for you!” said the young woman answering the phone in the Arlington County Clerk’s office. Waiting a very long time! Welcome to our new Shirlington Civic Association. Our urban village grew up so quickly in the past 20 years, didn’t it? We were all having such a good time living here that we never realized that it was one of the only parts of Arlington that didn’t have representation. Big mistake. Arlington County government and the independent Arlington Civic Federation depend on input from citizens funneled through civic associations, whether it is about taxes, streets, zoning, schools, parks or services. Civic associations are open to all – renters as well as owners — and provide a vital way for residents to get involved. As a condo board member said at one of our spring organizing meetings, “Now I understand why we never got the memo when anything was happening!” This applies also to having a community dialogue with the managers of the Village at Shirlington. We are delighted that Federal Realty will talk to us at our September 29th membership meeting at the Shirlington Library at 7 pm. Be there! Early in 2016 the County will start long-delayed master plans processes for the light industrial area along Four Mile Run Drive and Shirlington Crescent and a parallel process for Jennie Dean Park and Shirlington Park. While these areas fall into the neighboring Nauck Civic Association, all of us use these areas constantly. Done right, these plans can be transformational for our valley. The SCA will allow us a seat at the table and make sure we know what’s going on, communicate that to the Shirlington community, and get your reactions. I can’t thank our new board members enough for all they have done this summer. Bobby Crider jumped in as Treasurer to get us incorporated, set up a bank account (at BB&T of course! ), and more. Masha Sharma put together this amazing, mobile-friendly website in her “spare” time with a new baby and a business to run. Joel Mandelman has plunged into Arlington meetings and street repair issues. Neesa Wilkerson just finished her M.A. thesis and joined us as Secretary. I’ve gotten an “education” helping to identify a new elementary school site in south Arlington this summer. With your help, this is going to be a great year. Please go online to join the association. We need your energy, experience, ideas, dues, and donations for this start-up operation! We are so happy you were able to visit our site. We will continue to update you on the hot Shirlington Area Issues, please check back frequently on our Hot Issues page. If you are unsure about what we do take a look at our FAQs section in addition to the About Us Section.